Protect your business from the risk of fire, theft, accidental damage and third party liability. You can tailor a quote that suits your specific business needs. Our expert team can help you understand your obligations and manage workplace injury claims. 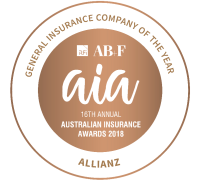 Allianz offers a range of insurance products and services to meet the needs of Australian commercial and corporate business. In Australia and around the world, Allianz aspires to be a good corporate citizen by supporting community, artistic, sporting and environmental projects. Any online discounts offered are applied to our standard rates, but excluding all other optional covers. A reduced online discount may apply on renewal. For Car Insurance, the online discount only applies to new Comprehensive Car Insurance policies and does not apply to Third Party Fire & Theft policies and Third Party Property Damage policies. Promotional or other discounts may apply from time to time for customers who apply for insurance via our Contact Centre. Any discounts/entitlements may be subject to rounding and only apply to the extent any minimum premium is not reached. If you are eligible for more than one, we also apply each of them in a predetermined order to the premium (excluding taxes and government charges) as reduced by any prior applied discounts/entitlements. Discounts may not be applied to the premium for optional covers. If this applies, an excess of $2,500 will apply if the vehicle is driven by an unnamed driver. The excess, if payable, replaces all other excesses which otherwise would have applied to the unnamed driver. It is not in addition to other excesses. Insurance is underwritten by Allianz Australia Insurance Limited (Allianz) ABN 15 000 122 850 AFSL 234708 and issued and managed by AWP Allianz Worldwide Partners Pty Ltd ABN 52 097 227 177 AFSL 245631 trading as Allianz Global Assistance as an agent of Allianz. If you purchase this insurance, Allianz Global Assistance is remunerated by Allianz for providing services on behalf of Allianz. This is a percentage of the premium. Ask us for more details before we provide you with any services on this product. Issued by Allianz Australia Life Insurance Limited ABN 27 076 033 782 AFSL 296559. 1. A policy must include Life cover, and you can also choose to apply for Critical Illness cover and/or Permanently Unable to Work cover. Maximum cover amounts apply and are dependent on your age at the time of application. The cover amount of Critical Illness cover and Permanently Unable to Work cover cannot exceed the Life cover amount. The minimum cover amount is $50,000 for Critical Illness cover and $100,000 for Life cover and Permanently Unable to Work cover. The maximum total amount you can be paid under a policy with more than one type of cover is the Life cover amount before any other benefits have been paid. Payment of all or part of a benefit reduces the cover amounts of all remaining benefits. Please refer to the Product Disclosure Statement ‘How much cover can I apply for?’, ‘Taking a combination of cover’ and ‘Maximum benefits payable’ sections for more details on limits on cover amounts. Issued by Club Marine Limited ABN 12 007 588 347 AFSL 236916 as agent of the insurer Allianz Australia Insurance Limited. Petplan Australasia Pty Ltd ABN 64 069 468 542 AFSL 245663 is the sole administrator of the policy and acts under a binder for Allianz Australia Insurance Limited who underwrites the Petplan products. Minimum premiums may apply. Any discounts/entitlements only apply to the extent any minimum premium is not reached. If you are eligible for more than one, we also apply each of them in a predetermined order to the premium (excluding taxes and government charges) as reduced by any prior applied discounts/entitlements.